We have rolled out all of the major changes described in the Upcoming changes post today. 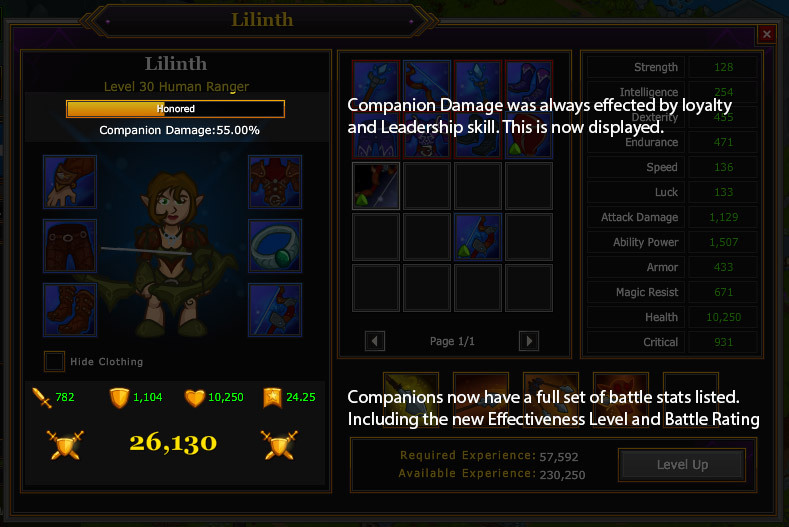 Level Effectiveness - Players, Companions, and Enemies now have an effectiveness level. The delta between combatants effectiveness levels is used to increase damage done by higher level combatants facing lower level combatants and to increase the chance to critical hit. 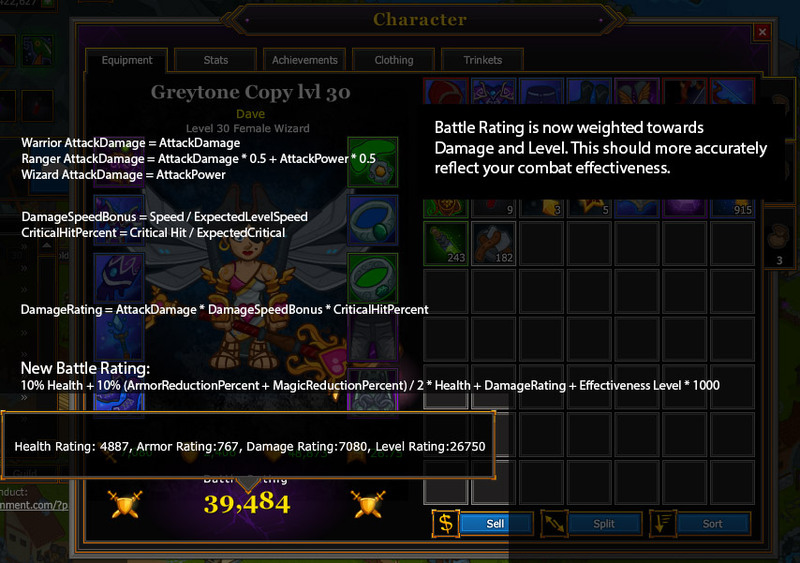 Improved Battle Rating - The battle rating is now heavily weighted to how much damage you can do. This should make it a much more accurate measure of combat potential. To account for this change, the Battle Rating rankings have been cleared. Companion Gear - Companions can now equip any gear that they meet the class requirements for. This includes found gear, gear from the Hall of Trials, Paragon Brotherhood, and the new Crafting System. 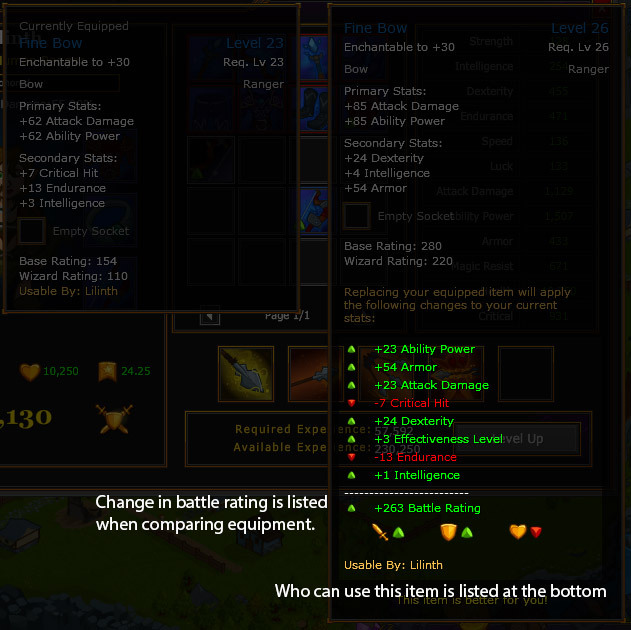 Improved Item Comparisons - The change to your battle rating is now calculated for each item comparison. This should make it significantly easier to see which items are better for you to equip. 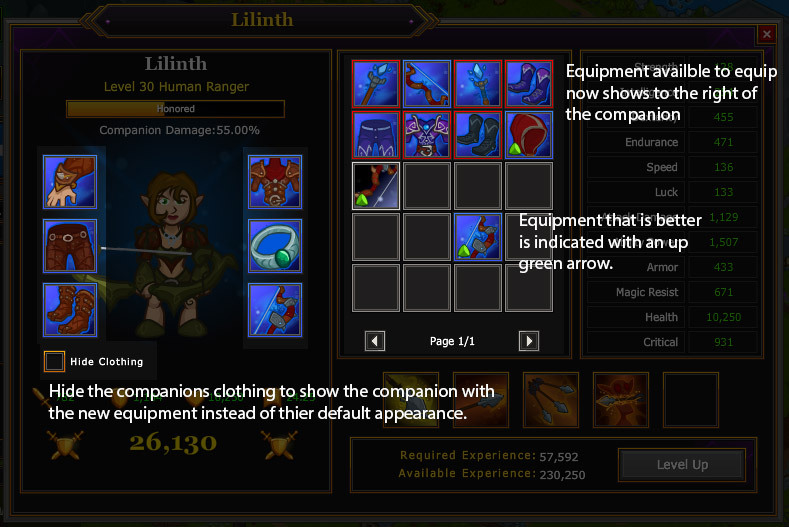 They are also indicated with a green up arrow on the inventory screen itself so you don't have to mouseover to see if it will be better or not. Improved Item Drop Rates - We have increased the drop rate of uncommon and rare equipment to provide more items to salvage at the blacksmith to provide for crafting and levelling up the blacksmith. Also, you can now turn off friend invites and guild invites in the Settings tab. As well, the Skill book now shows the costs for the skills. So for the damage rating a ranger really gets screwed. by dividing the AD and AP by two in the attack damage score it becomes impossible for us to compete in the BR rankings. Typically a rangers AD and AP will be slightly over half what a wizard or warrior have in AD or AP. this is because we get some benefit for both AD and AP. but our primary stat already has the divide by two built into it (1 dex = 1.5AP and 1.5AD). by applying the divide by 2 again our rating is far lower than it should be. hence, from the way the damage rating is calculated, the overall damage rating for rangers is half of the other classes. as rangers do get some advantage from all of AP and AD giving stats don't negate the multiplyer completely, but set it at 0.9-0.95 so we can at least still compete in the scoreboards. You may be correct, I will take a closer look at the numbers and if they are off in that way I will adjust the battle rating score. I am stuck right now in the bounty. Refreshing has no effect, clearing my cache has no effect. What do I do? I can't create a ticket because I can't access the page. OK - we're out. But we had to clear cache, reset memory and wipe history 3X to do it. and still the calc says that 2nd adds 295 BR to Lilinth. The second item is 5 levels higher than the first item. The new level effectiveness stat makes a big difference in battle and that is why the second item still results in a higher battle rating despite the other stats being lower. I feel like I'm missing something obvious here. I don't get why a piece of equipment for a companion only loses stats but has a positive effectiveness rating and increases their battle rating. "10% Health + 10% (ArmourReductionPercent + MagicReductionPercent) / 2 * Health +DamageRating + Effectiveness Level * 1000"
So that is per the formula 10% of 36000 + 10% of (10% + 20%)/2 * 36000 + 10000 + 28 * 1000. So I am not sure where you are going wrong, but to get 3,016,675 you are multiplying something out of order. 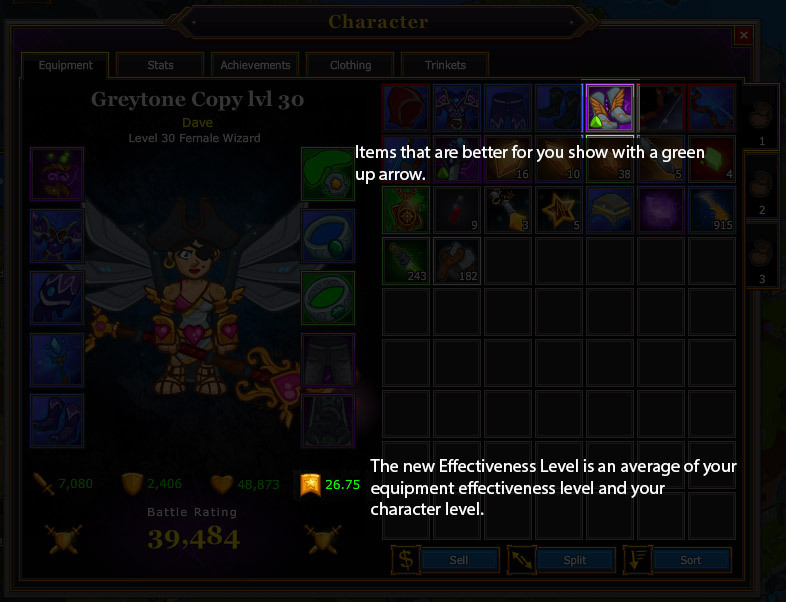 Your Effectiveness Rating is calculated as the average of the levels of the equipment you have on and your level. In battle difference in Effectiveness Level changes damage/taken and received. This is calculated on a curve that maxes out at 10 levels difference. At a delta of +10 you do 50% more damage and take 95% less damage, you also crit more often. For example lets say you were facing a monster that was level 25 and you are level 30, and your equipment averages to say 26 so your Effectiveness level is 28. That gives you a delta of +3. Without doing the math exactly, that works out to you doing about 18% more damage when you attack the monster and you taking about 25% less damage. With that example you should be able to see why the equipment level is just as important as the stats now - in fact sometimes more so if the level difference is high enough. Yes, that is the explicit writing of the implied brackets that result from applying the correct order of operations. "10% of (10% + 20%) / 2" == "5% of (10% + 20%)"
But that's the only thing I can find to simplify there. Doh! I just realised, all the ratings added together (when you hover over battle rating) equal the Battle Rating!